What is fall and late summer without sunflowers?! 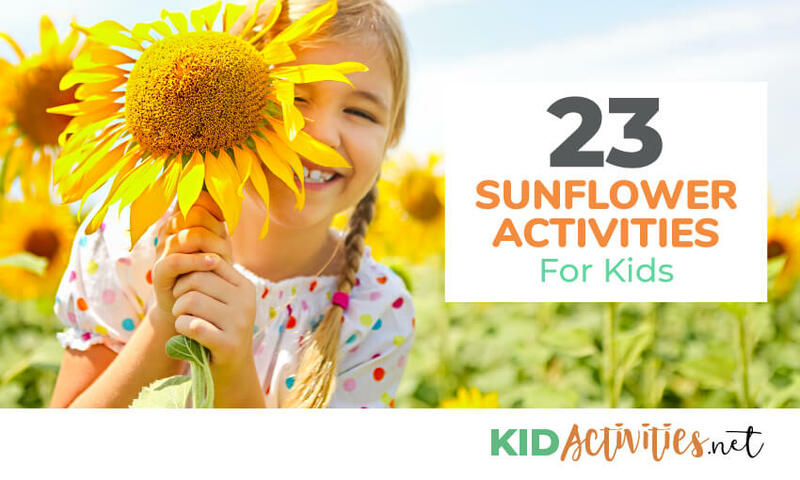 Below are some sunflower activities to brighten up your warm weather days! Glue a sunflower seed (or any kind of seed) onto paper. Next paint an imaginary plant with the roots growing FROM the seed UNDERGROUND……..and paint the leaves, and flowers or fruit of the plant above the ground level. Cut the centers out of paper plates. Staple a jumbo craft stick handle to the bottom of each mask. Have children hold their masks so that their faces show through the open centers. 1. Once a sunflower head has gone to seed and started to dry, harvest the seeds to make a pretty necklace. 2. Thread a length of nylon string onto a thin needle and carefully push the seeds onto it, one by one. Push the needle through the fat end of the seed, from edge to edge. watch your fingers ! 3. Tie 2 lengths of nylon to the ends of the necklace so that you can tie it around your neck. If you have the clasps from an old necklace, sew these to the ends of the string. Have children cut out several yellow petals and paste on small paper plate previously painted yellow. Fill the centers with sunflower seeds. 1. Paint the sunflower designs on the pots first before assembling and let dry. 2. Cord must be at least 3 times the length of the 5 clay pots. This will allow enough cord to make knots when attaching the pots to one another. 3. Fold cord in half and tie a knot leaving the loop long enough for the hanger. Thread the two ends of the cord through a large bead. Beads must be large enough so that they will not fit through the hole in the bottom of the clay pot. 4. Thread the ends of the cord through the upside down clay pot that you want to be on the top. The top pot is the most decorated, with painted sunflowers. 6. Repeat step 5 until all pots are threaded together. Be sure to knot cord sufficiently to keep them in place and separated on the cord. Paint small paper plates yellow. Paint craft sticks green; glue or tape them to the back of the plate. You can either glue sunflower seeds in the middle, or have the kids draw/paint eyes, nose, moth, etc., to make sunflower faces for their stick puppets! You can’t think of a sunflower without thinking of Vincent Van Gogh’s famous Sunflower series and his impressionist style. 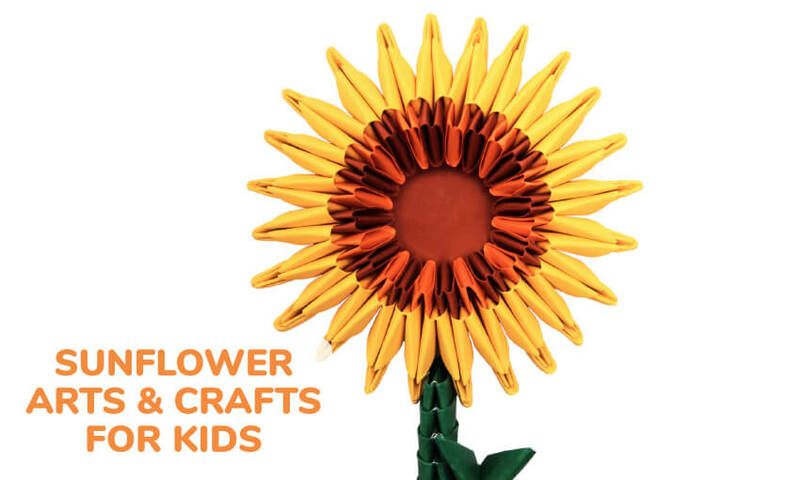 Purchase a big and beautiful sunflower for the kids to do a still life. Show them examples of the artists’ work, so they have a grasp of what the artist is about. There are many Van Gogh books and poster to be found. Set the still life with the giant sunflower in a plain vase. Use 9 X 12 drawing drawing paper; instruct children to lightly pencil sketch the still life. When they are ready to start coloring, encourage them to use a little bit of pressure, to release the oil pastel’s color. Always allow children to adapt art to their own unique vision! Encourage them to be creative with their vases, so they don’t come out the same. As a final touch, have each sign their vase, just like Van Gogh did. The sunflower paintings were made by third grade children. You can arrange sunflower seeds in patterns and glue to cardstock to make cards and other crafts. This is a great way to recycle an old puzzle. Find your puzzle piece and paint the front with black acrylic paint. Let it dry thoroughly. 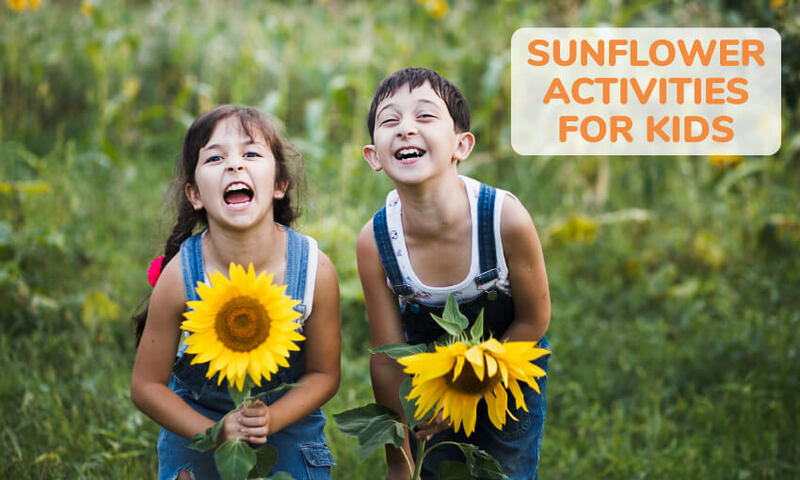 Select a picture of a sunflower that will fit nicely on the puzzle piece. A picture may be found in an old magazine, seed packets, greeting card, stationery, stickers, etc. Cut out and glue the picture on the puzzle piece using the white craft glue. With the hot glue gun attach the 3 sunflower seeds to the puzzle piece. Let it dry thoroughly. Apply the acrylic sealer to the entire pin coating the flower and the sunflower seeds. Let this dry thoroughly. Turn the puzzle piece over and hot glue the pin fastener to the back. for the birds. A lot of birds such as blue jays and gold finches love sunflowers and will thank you with their presence if you put out some for them. Store the sunflowers in a dry cool place (such as a seed saver or plastic bag). Make sure the sunflower seeds are completely dry before storing to be sure no mold grows on the seeds. Celebrate sunflowers by planting several varieties and sizes. Cut up seed catalogs to visually plan the garden. Turn the garden into a bird-feeding haven for the fall. Add a bird bath, bird ornaments, and birdhouses. FYI: In a warm temperate climate sunflowers grow from seed to flowering stage in about three months and another six weeks until the seeds mature in the flower head. This relates to the giant flowering types-some of the smaller varieties are quicker to mature. Sunflower seeds are fun to pick off the heads and roast in the oven for a quick snack. It will take a little over three months to get sunflower seeds. You can harvest the sunflower seeds when the middle of the flower starts to turn brown. You have a couple options at this point. You can either fight wildlife and leave the seeds to dry naturally on the stalk or cut the head, keeping about six inches of stem, and hang it up somewhere safe to dry. Put a piece of pantyhose or a bag on the head to catch any drying seeds that might fall out. Once you have the seeds, you can roast them. Preheat an oven to about 300 degrees. Lay out the seeds on a cookie sheet. Make sure they are evenly spaced for better roasting. You can add salt, pepper and other herbs to taste, but it’s not necessary. Add a little cooking oil if you want to get them browned quicker. Olive oil works well because it will not brown them as fast and tastes good with the sunflower seeds’ naturally nutty flavor. 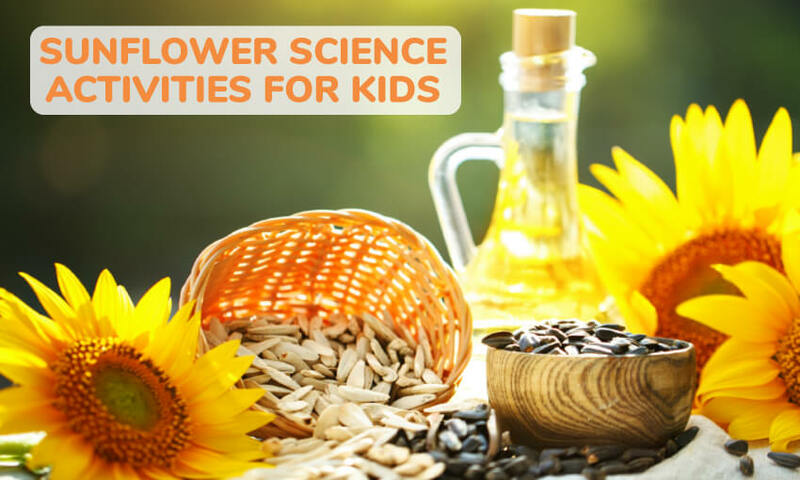 Find more science activities from KidsActivities here. On a small plate, take a round of bread and spread it with peanut butter; this makes the sunflower center. Last have children place mandarin orange slices around the sunflower centers for petals. Wash apple. With a sharp paring knife, cut the top off horizontally (so that it makes a lid). Hollow out the apple, and keep all pieces that do not have core or seeds. Cut all the usable apple (from the hollow process) into small pieces. Put them into a small bowl. Mix in the sunflower seeds, flax seeds, and raisins. Dust with cinnamon to taste. Add the orange juice concentrate, mix well. Next, coat the inside walls and bottom of the apple with peanut butter. Spread some peanut butter over the inside of the “lid” as well. Sunflower seeds are packed with polyunsaturated fats, essential linoleic acid, and vitamin E, all of which are heart healthy. Sunflower seeds also contain zinc and potassium! 16. Make sunflower cookies or cupcakes. 1. Buy or make your favorite round cookies/cupcakes. 2. Frost your cookies with yellow frosting/icing. 3. Add candy corns (pointing outward) around the edge of the cookies or cupcakes.This will create the petals of the sunflowers. 4. Last, put chocolate chips in the center for the sunflower seeds. The image shown are ‘Sunflowers’ made using cupcakes. Melt 2 squares of chocolate in microwave oven. Drop in dollops onto wax paper. Let chocolate set up for approximately 20 minutes. Makes: 6 to 7 (medium size). Preparation time: 3 minutes. Set-up time: 20 minutes. Tip: Chocolate covered sunflower seeds can also be purchased on stores and are great in may recipes including muffins! 2. Frost the cake yellow and place it in the center of a serving dish. Put mini Hershey Kisses or other roundish chocolate candy on top. These are the “sunflower seeds.” Start in the center and work in circles to the outer edge. 1. Mix together cream cheese, raisins, grated carrots, and raw sunflower seeds. 2. Spread the cream cheese mixture inside half of a small pita. You could also first spread the cream cheese in the half-pocket –and then add the other food items as desired. Set up a fall relay with the kids. Fill large containers with SUNFLOWER SEED bird feed. Have smaller, clear containers at the opposite end. Kids fill up a cup with seed and race to dump it into the empty container. They sprint back to the start and hand-off the cup to the teammates. Goal of the race is to be the first team to fill up the small container with the seeds. As an extra challenge, give the kids an over-sized soup ladle instead of a cup. Don’t worry if the seeds spill; that’s part of the fun! The birds will easily find them later. Tips: Try a dollar store for inexpensive clear containers. They usually stock plastic ones in apple or pumpkin shapes in the fall. Popcorn or candy corn also can be used in place of seed. 1. Just as in musical chairs, place the pictures in a circle. Each child stands on a picture. When the music stops, the child standing on the insect/bug is out. 2. As each child is out, remove a sunflower from the circle until one child is left standing on a sunflower. Play this sunflower “rhyme” with your musical sunflowers game! 22. *Guess the closest number of seeds in a live sunflower. The number can exceed 1000! Just put out the sunflower head—and pieces of paper and pencils. The children guess and—the closest is the winner! If you have very young children and use a sensory table. You can fill it with unshelled sunflower seeds. Provide measuring cups, spoons, pie tins, etc. Need more warm weather activities? We have ideas to brighten up your whole summer!